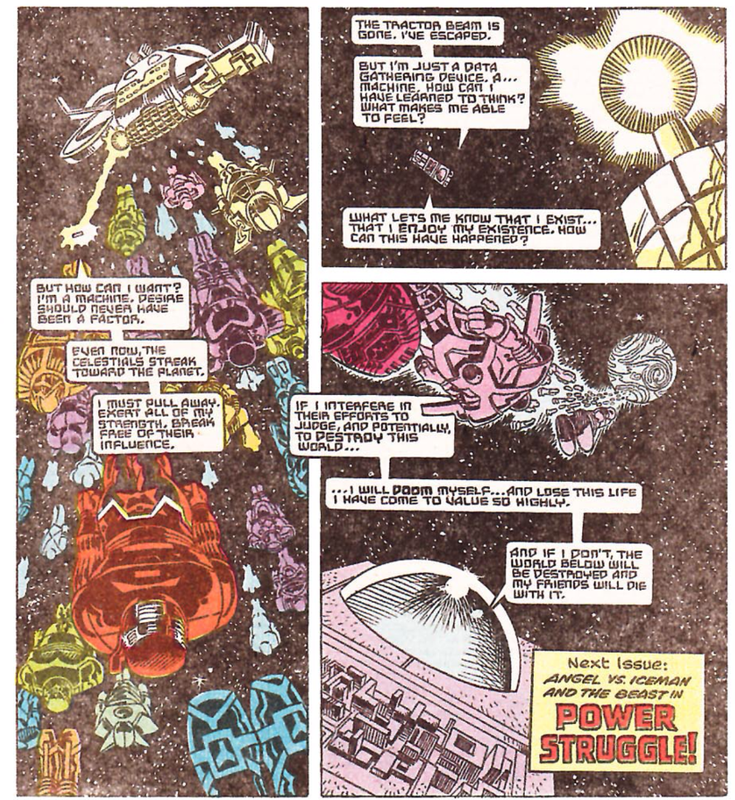 More Celestials arrive as prisoners are exchanged. 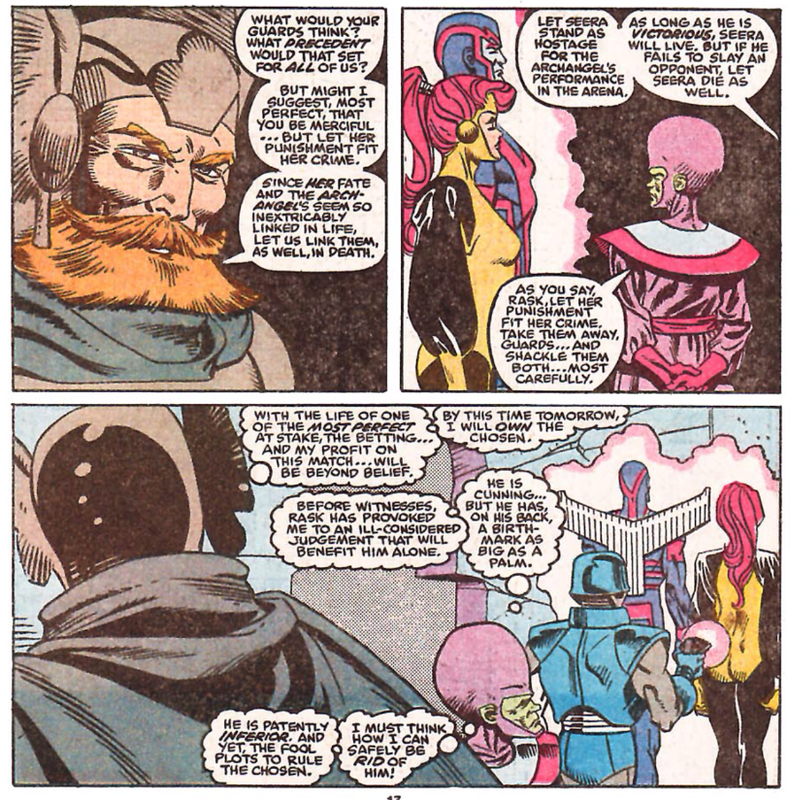 In the common ground between their cities, representatives of the Chosen and the Rejects exchange prisoners, with the Rejects successfully bargaining Marvel Girl for Agrom and ten other gladiators. Meanwhile, inside the Chosen City, Seera is told to prepare for her alliance with Rask, but she resists, telepathically attacking the guards and rushing off. Outside the city, Cyclops and the Beginagains plot their route inside as another Celestial lands on the planet. Inside, Seera frees a drugged Archangel just as Rask arrives. Archangel tries to flee with the woman, but is shot down and recaptured. Rask then strong arms Palik into tying Seera's fate to Archangel: should he fall in his battle with Iceman, so to will Seera die. Meanwhile, the Rejects celebrate the return of Agrom, and Beast uses the distraction to escape from his cell. Agrom spots him and the two fight, but when Agrom learns Beast is Archangel's friend, he embraces him. In the Chosen city, a group of scientists attempt to learn Christopher's origins as a third Celestial lands, observed by Iceman and Lev. In the Reject city, Agrom corroborates Beast's story of how he ended up on the planet. Beast wonders if Zarkah's people will still follow him into the Chosen city; she suggests they'll do as Agrom says. In orbit around the planet, Ship, having learned the truth of his origin, debates his next action as more and more Celestials arrive on the planet, knowing their impending judgment means the end of the world and his friends with it. Ship is declared to be a "data sampling unit" created by the Celestials, a declaration quietly made in this issue after various hint in that direction in previous issues. Presumably, then, Apocalypse somehow took control of the technology and claimed it for himself. Baby Christopher is able to tell when Madelyne takes control of Jean's body, activating his telekinetic force field as a result. Two more Celestials land on the planet, just outside the Chosen city this issue, while a whole mess more are seen heading towards the planet from space. 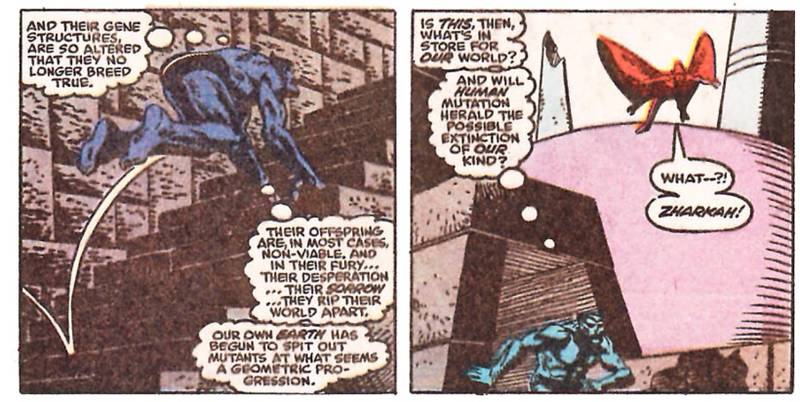 Beast once again worries if the fate of this world, in which widespread mutations have made breeding nearly impossible, will be the fate of Earth if mutants continue to increase. Other Chosen settlements are mentioned, suggesting there are more cities/communities on this world beyond the two main cities where most of the action takes place. Though not entirely its own fault, coming as it does on the heels of the completely disconnected fill-in story in the previous issue, this reads like the most wheel-spinningest chapter yet. 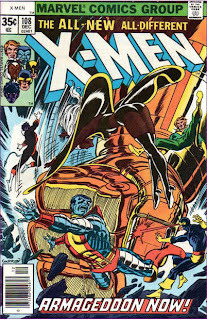 Issue #46 began the business of moving the characters into place for the finale, having the scattered members of X-Factor all converge on the Chosen City as Seera's crimes were discovered. Then issue #47 did nothing, and now this issue...moves everyone closer to being reunited a slight bit more. There's some nice moments here and there - Beast having his story verified by Agrom, the mounting threat of the Celestials - but for the most part, this is just a lot of recap and incremental plot movement, at a time when the already long-in-the-tooth story should be ramping things up for the conclusion. Next week, "Acts of Vengeance" part one, Excalibur #16, and Wolverine #18. 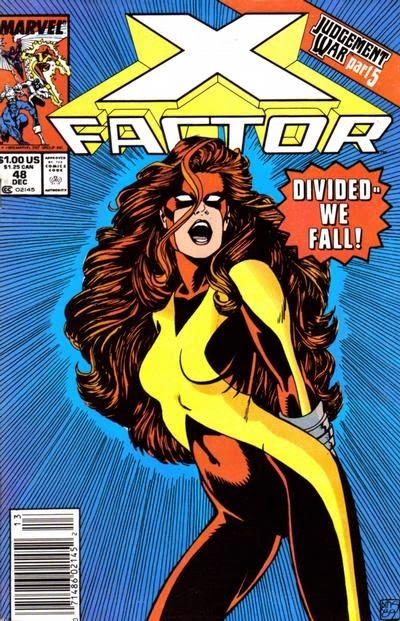 Much like New Mutants at this point, both storylines elicit a huge "yaaawwwn" by this point. I still do think both stories would be better had they been 1 or 2 issues shorter. unrelated cuz this comic is hella boring, how about that Star Wars #2, huh? Crazy decompressed, but really exciting anyway. a combination of Aaron’s voices for the cast and knack for pulp material, Cassaday’s realistic characters and widescreen panels, Laura Martin’s rusty colors bringing the world to life, and Eliopoulos’ lettering that makes people talking on a radio and Threepio talking distinctive from one another, it succeeds in crafting a breathless cinematic pulp adventure feel of the original Star Wars trilogy. Rask looks like he stepped right out of Gil Kane art for The Ring of the Nibelung. Yeah, cut out the unrelated fill in issues and then one issue of actual story, and both would be still-long but much better narratives, overall. @Jeremy: how about that Star Wars #2, huh? Yeah, it's tons of fun. I reviewed it here, and said pretty much everything you did. They bash Manara cover on a Marvel book, but this one could be straight from a Manara album.